Johnny Scot Van Ras after what turned out to be his winning argument in city court on Jan. 28. A copy went to Albany Police Officer Steve Corder, who at 9:13 a.m. on Thursday, Oct. 11, had cited Van Ras for driving 39 mph in the 20 mph school zone on Waverly, east of the South Albany High School athletic fields. The normal speed limit there is 40. Van Ras, a 62-year-old retired mill worker who lives on 45th Court S.E., did not deny that he had driven the ticketed speed. His argument was that the school zone was not properly enacted, so that legally it was not a school speed zone at all. He cited two failings of this zone: Contrary to ODOT guidance, it was created without an engineering study justifying it, and it lacked signs showing where it ends. For his 15-minute trial on Jan. 28, Van Ras appeared by himself, without a lawyer or anyone else to advise him. It was just him in the courtroom, along with Officer Corder, Judge Robert T. Scott, one or two other defendants in other cases, and one observer (me). The judge at first sounded skeptical but took the case under advisement. A few days later, after reviewing the law and ODOT regulations, he wrote Van Ras saying he was inclined to agree with him that zone-ending signs were required. He sought the defendant’s consent to consult with the city attorney because this outcome would have a significant impact on the city. But Van Ras declined, saying in his reply that the city council had had plenty of opportunity to consider the situation. The court’s letter with the not-guilty verdict followed. It was dated Feb. 7. Van Ras was the second of two southeast Albany residents — the first was Diane Conrad — who appeared before the city council last year, asking the city to get rid of the school zone on Waverly near South High as unnecessary, or to modify it. The council then asked for an engineering study, which the city’s Traffic Safety Commission will review at 10 a.m. Monday at City Hall. The study recommends that the 1,200-foot zone be shortened to 400 feet and remain in effect from 7 to 5 on school days. As for the significant impact of his ruling mentioned by Judge Scott, its extent is unknown. Chances are that once the study’s recommendations are carried out, modified or rejected, the city will hasten to install signs to show exactly where the zone ends. In the meantime, tickets for failing to slow to 20 mph are unlikely, as long as Judge Scott is on the bench. As it happens, the judge, a contract employee of the city government, announced to the council Monday that he’ll retire on Dec. 31 this year. He had informed the city manager of his plans a couple of months ago, so clearly his decision to retire had nothing to do with this case. 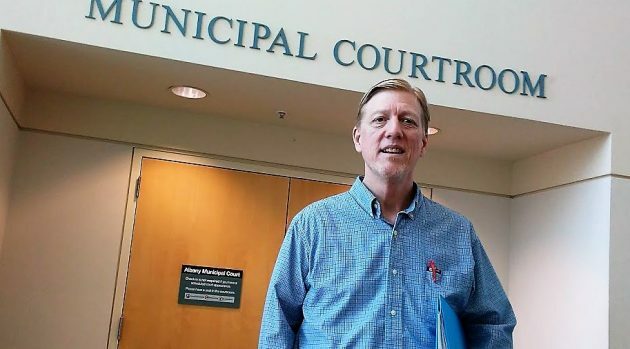 In his annual report about court operations and finances, Scott reported that cases filed in the city court increased 15 percent in 2018, following a 25 percent boost the year before. After payments to state and county, net revenue from fines rose too, to $840,817. But so did expenses, partly due to payments to court-appointed lawyers and an increase in the cost of housing prisoners at the county jail. Upshot: the city court in 2018 had a deficit of $75,544, still significant but almost 60 percent smaller than the year before. 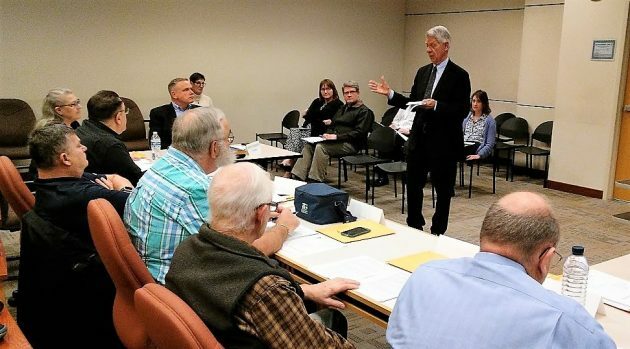 In a file shot, Judge Scott talks to the city council a year ago, in January 2018. My feeling is that many of these 20 mph zones are unnecessary. Particularly when there are no kids around. After your first article, I went to Google maps to see where this speed zone is. My first thought was, why is there a speed zone so far from the school’s front? Second thought was, aren’t these high school kids? And, in the event that they’re actually walking this far to cross Waverly, aren’t they old enough and responsible enough to know how to look for oncoming cars and use the crosswalk before crossing the street? How many folks just bite the bullet and pay the fine? I wonder.To me, many of these speed zones are nothing more than revenue gatherers for the city. I anxiously await the results of the engineering study. My guess is, one of two things will happen. Either a new zone, with flashing lights to indicate probable presence of students (notice I didn’t say ‘kids’), will be installed. Or, more likely, given the distance from the actual school, the zone will be eliminated altogether removing the incentive for police to use it as a revenue gathering apparatus. I anxiously await the outcome. Thanks Hasso. There is no revenue if you obey the law. The Judge made the proper decision. Thank you and thanks to Van Ras for his efforts. Perhaps this will create a wave of challenges to specific school areas with restrictions that should be changed. In this day and age, when the planet is struggling for survival against the onslaught of the human horde, and OPB is disseminating “trigger warnings” about everything that might possibly offend, and ill-informed parents are threatening society at its core by refusing to vaccinate against deadly disease, the thought that anyone in this community would bother to do battle over an issue as inconsequential as a school zone speed limit tells you a great deal about how little retirees have to do. This “victory” is one more lurch down the road to anarchy. One recalls clearly Rudy Giuliani sending out his police to clean-up petty street crime. Rudy’s Theorem? Allowing small crimes (speeding and endangering in a school zone) to be ignored inevitably leads to more serious offenses. By allowing an admitted scofflaw to walk away free based on a technicality erodes respect for the rule of law, debasing community standards. Once again Albany snatches defeat from the jaws of victory and we are forced to take another step away from a just and civil society. Rudy’s PD did crack down. Albany’s legal system seems not to understand the concept. What’s to follow will only be worse. That “broken window” theorem of Mayor Giuliani was adopted in NYC and it worked — major crime/murders were substantially reduced. Apples v. oranges does not apply — no context to driving safely thru school zone with no walkers present. If City wants to place restrictions there is a legal way to do it. City must follow the law. The judge actually found the City negligent in signage. This is not a step on the road to anarchy, and why anyone would criticize someone for contesting a ticket is beyond me. Note: The one time I appeared before Judge Scott, contesting an equally questionable ticket (and losing), three other defendants prevailed simply because their citing officer failed to show up for court. That reflects poorly both on the system and on the officer, but not on Judge Scott, whom I respect as a reasonable man and straight shooter. We know Scot Van Ras Andre and he retired as an accountant for one of our local mills. Very well informed and great person. The original article does not do him justice. The thought that an admitted speeder is to become some manner of cause cé·lè·bre is revealing. Unfortunately, the view’s quite ugly. The level of impatience and selfishness demonstrated by this individual is unfortunate and something to pity. On the contrary, using patience and logic, he used the legal process to strike a blow against an unnecessary regulation that was costing people money without benefiting anyone. That’s the opposite of selfishness or impatience. The impatience to which I am referring has nothing to do with utilization of the legal process. It is regarding the approximately 15 seconds of additional time required to traverse that section of road at 20 mph compared to 40 mph. And as for selfishness, devaluing the safety of the children and families who use the intersection by referring to it as “an unnecessary regulation that was costing people money without benefiting anyone” pretty much sums it up. Challenging the status quo as imposed by government is a civic duty. I tip my hat to Johnny Scot Van Ras. Really?! Even though I disagree with the ruling itself, I applaud his use of process to get his desired outcome. However, I believe your above comment strains credulity and is a tortured interpretation of why he did it.